K-Pop and Korean lifestyles, who doesn't know in Bhutan. Korean lifestyle has a huge influence in our Bhutanese people, especially the youths. Music, dress, food, hairstyle, almost every bit of the youths' life in Bhutan is has so much similarity. Which even give the sense of Koreans' vibrant presence among us. If anybody takes a casual walk around Thimphu city, it's very obvious that Koreans alike Bhutanese youth are everywhere. Talking of which the recent tragic death of K-Pop singer Jonghyun of Shinee at 27 brought so much sorrow and pains in the hearts of Bhutanese youth. 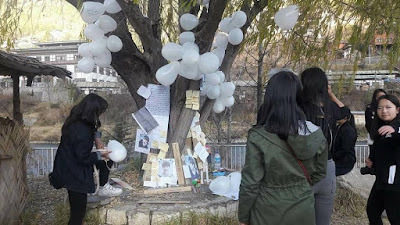 They even took it to the street, an open space to mourn the death of an accomplished singer, songwriter and dancer, Jonghyun.